Performers include: Lucille Ball, Gale Gordon, Ann Dusenberry, Larry Anderson, Jenny Lewis, Philip J. Amelio II, and Donovan Scott. 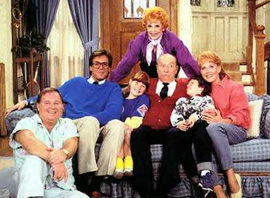 This sitcom begins as widow Lucille Barker (Lucille Ball) is making some big changes in her life. Her husband Sam, the co-owner of M & B Hardware, has passed away. So, after some time, energetic Lucy moves in with her adult daughter and her family to help out. Daughter Margo (Ann Dusenberry) is married to Ted McGibbon (Larry Anderson), a law student and the son of the other half of the hardware store. Margo and Ted have two young children, intelligent Becky (Jenny Lewis) and precocious Kevin (Philip J. Amelio II). Margo is looking forward to having her mother around while Ted is worried about what his father’s reaction will be. Grumpy Curtis McGibbon (Gale Gordon), is vacationing in Hawaii and returns just as uptight as ever. He’s not pleased with what he finds. Not only has spirited Lucy moved in with his son’s family but she’s also been running the hardware store in his absence. The store’s one employee, hapless Leonard Stoner (Donovan Scott), got sick so she had no choice. But Lucy decides that she likes working at the store, takes an active role in the business, and makes Curtis’ life miserable with all of her crazy antics. By the end of the first episode, Curtis announces that he’s moving in with the family too. With two very different grandparents living under one roof, the family’s life is anything but dull. Lucy and Curtis return home from a long day at work. She’s about to get one of her healthy casserole concoctions ready for dinner. She started it cooking before they left the house that morning. Not wanting to eat it, Curtis had turned it off and then secretly ordered pizza while they were still at the hardware store. The family and Leonard return home and they’re celebrating. Young Kevin has just scored the winning goal for his soccer team. He’s been given a special trophy and, one by one, they all recall when they each won trophies of their own — even the pizza delivery guy. Everyone has won one except Lucy. At dinner the next evening, Becky tells everyone that they’re having a Grandma talent contest at school and she’s entered Lucy. Lucy’s upset that Becky didn’t ask her first until she learns the winner gets a trophy. She starts thinking of what she can do. Singing is quickly nixed, as is tap dancing. She’s also not very good at telling jokes. Ted offers to teach her some magic and later, Lucy holds a practice performance for the family. It doesn’t go very well, especially when she performs a trick with Curtis’ antique watch and accidentally smashes it to bits. Dejected, she cries that she’ll never be good at anything and gives up. On Sunday, Becky’s friend Patty (guest Kellie Martin) is at the house playing and says that she’s sorry that Lucy has to be out of town on the talent contest day. After she’s left, Becky confesses that she lied because she’s always bragged about her grandmother to the other kids and is embarrassed. Becky leaves in tears and Curtis recalls that they recently watched the musical My Fair Lady on television. Rex Harrison didn’t sing in the movie, he just talked the lyrics. He suggests that Lucy could do the same thing. She likes the idea and decides to do it. At the talent contest, following an all-female Dixieland band, Lucy performs a touching rendition of Sunrise Sunset from Fiddler on the Roof. She doesn’t win but she’s glad that she tried. The grandkids later present her with a trophy for being the “World’s Greatest Grandmother” and she’s very happy with that award. This episode did not air on ABC. • The Saturday night premiere ranked 23rd for the week in the ratings. Viewership declined quickly in subsequent weeks and it became one of the lowest rated shows on television. ABC bought out the contracts and cancelled the show after eight episodes had aired. • On the day that the final episode was shot, executive producer Aaron Spelling learned that ABC had cancelled the series. Ball’s husband and executive producer, Gary Morton, decided not to break the news until after the episode was completed. Ball was devastated by the news and recounted that, while they were leaving the lot, she felt like a leper. She also felt very badly that the cast and crew were also out of work. • The series received many poor reviews with critics feeling that the plots were old-fashioned and predictable. Ball felt personally attacked and talked about being criticized for coming back to television at all and belonging in a retirement home. After the show was cancelled, she felt like the public no longer loved her. • The last episode of Life with Lucy that aired, “Mother of the Bride,” featured The Honeymooners’ Audrey Meadows as Lucy’s sister. There were talks about making her a regular to give Ball a partner (reminiscent of Vivian Vance) but it never came to be. • The script for the 14th episode, “Twas the Flight Before Christmas,” was written but wasn’t shot due to the cancellation. Life with Lucy’s ratings then (4-5 million viewers), would be killer numbers these days. The show was not that bad. It is certainly better than the garbage aired today. I OWN ALL OF THE 13 AIRED EPISODES OF THIS LONG FORGOTTON SERIES-LUCY’S LAST. SHE FELT THAT THE PUBLIC DID NOT LOVE HER ANYMORE,BUT LUCY WILL ALWAYS BE LOVED. SHE PASSED AWAY 3 YEARS AFTER THIS SHORT LIVES SERIES WENT OFF THE AIR IN 1986. @Edward Bowmaker: I think the show holds up much better as a rerun. If you look at it as a simple old-fashioned sitcom from another time, it’s quite enjoyable.